Wi-Fi analytics offers an easy option to study, understand, and analyze the demographics of the population that uses the Wi-Fi services. It gives a point of entry to gauge the propensities of the users, their location, interests, and search interests. Hence, several industries use Wi-Fi analytics to tabulate key consumer data and use it to make informed decisions. The emergence of Wi-Fi analytics has assisted several industries and sectors in enhancing their services and offerings by studying the propensities of the consumers. Governments have become aware of the need to study the demographics and tendencies of the populace before initiating new plans, projects, or policies. Moreover, Internet of Things (IoT) technologies such as waste management, smart homes, and smart cities also rely on Wi-Fi analytics for data insights. Furthermore, businesses have become aware of the need to conduct data analysis before planning and strategizing their moves. This has helped in the growth of the Wi-Fi analytics market globally. The Wi-Fi analytics market can be segmented based on deployment, end-user, application, and region. The deployment segment is classified into on premise and cloud/SaaS model. The cloud/SaaS model type is significantly popular among users. Within the application segment, marketing and advertising tends to hold the largest market share in terms of revenue. Several end-use industry verticals, especially the retail stores, hypermarkets, supermarkets, and malls are using Wi-Fi analytics platforms to increase footfall, analyze customer behavior, and formulate promotional strategy. Also, retail industry is expected to expand at a higher CAGR during the forecast period. 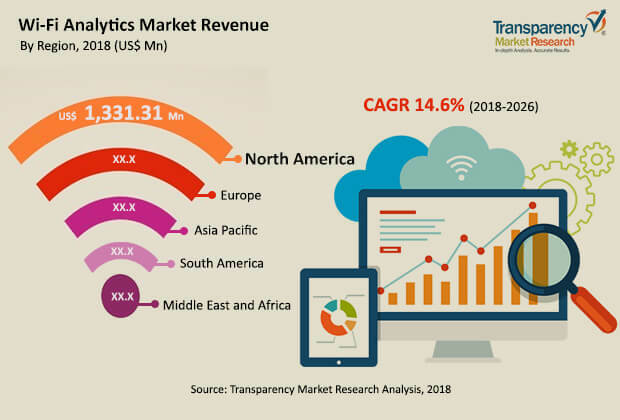 In terms of geography, the Wi-Fi analytics market is segmented into five regions namely, North America, South America, Middle East & Africa, Asia Pacific, and Europe. Among these, North America is expected to hold a major share of above 40% of the market, in terms of revenue, by 2026. The continuous adoption of analytics platforms among mid-size and small retail stores and hotels is the major driving factor for the strong growth of the Wi-Fi analytics market in North America. Major players operating in the global Wi-Fi analytics market include GoZone WiFi, Purple, July Systems Inc., Bloom Intelligence, Cloud4Wi, Inc., Ruckus Wireless, Inc., Cisco Meraki, and Hughes Systique Corporation. These players are focusing on acquisitions and new strategic collaborations in order to increase their market share in the global Wi-Fi analytics market.